Download Previous Solved Papers of Bharat Sanchar Nigam Limited (BSNL) Examination for Direct recruitment in the cadre of Telecom Technical Assistant Open Competitive Exam-2007. 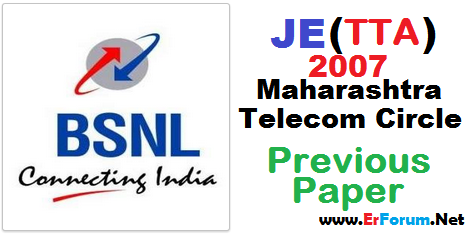 We have already posted two previous papers of BSNL TTA Maharashtra Circle of Year 2008 and year 2012. You may download those two papers from this Link. Share and Like motivate us to post more such Previous Papers. So, Please Like & Share it.